I always thought Japan topped the scales with their array of weird and wonderful vending machines, selling everything from batteries to rice, but it seems that with this latest auto-vendor from China, I have been wrong. Shanghai Hairy Crab’s are obviously such a common food stuff in China that they warrant their own vending machine to meet consumer demand. But really, you have got to be kidding, right? 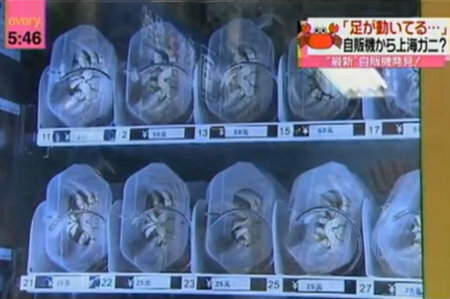 The vending machine maintains a temperature of 5 degrees celsius (41 Fahrenheit), so that the stock of live crabs is kept in a state of hibernation, until bought. A sign on the machine also guarantees the freshness of all its crustaceans. If you happen to purchase a dead-un, you will be compensated with three free, live crabs in return. I can hear the animal rights activists going wild.